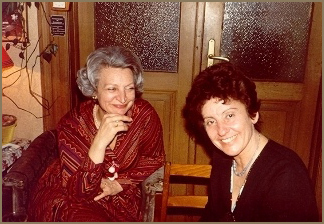 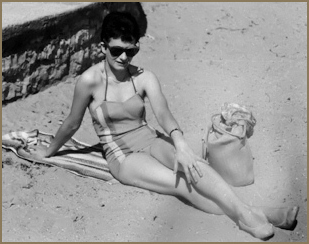 Mária Hegyessy, János Sebestyén's close friend and trusted page-turner for concerts and recordings, with Sebestyén on his 50th birthday, 1981. 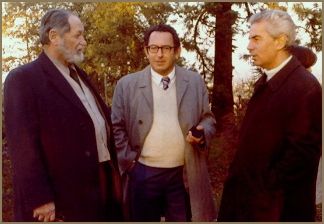 János Sebestyén and Thomas Gallia in Italy with Stefano Cerruti, son of actress Erzsi Paulay and step-son of Italian ambassador Vittorio Cerruti, mid 1970s. 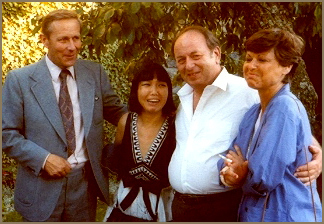 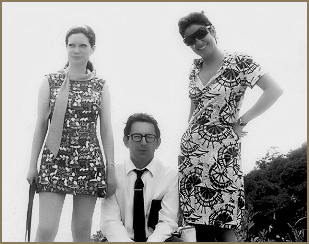 Swiss concert manager Maurice Wenger, record producer Paul Déry and his wife Setsuko, and Bea Crivelli, wife of the Swissair station manager, in Sion, early 1980s. 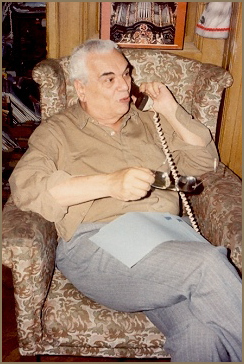 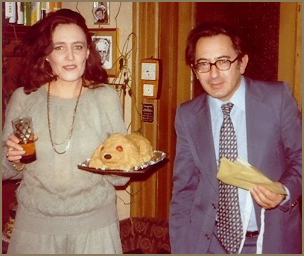 Güngör Basman, wife of Turkish ambassador Osman Basman, with János Sebestyén at his home, early 1980s (above); bath time for Sebestyén at the Austrian residence in Helsinki, courtesy of ambassador Josef Dengler, 1985 (right). 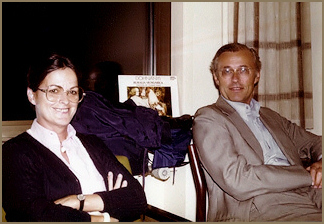 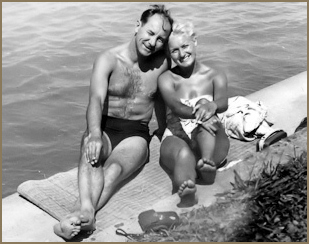 Sven Kouchler Poulsen, Danish chargé d'affaires in Budapest during the 1960s and later ambassador to several African countries, with his wife Ulla in Copenhagen, mid 1970s. 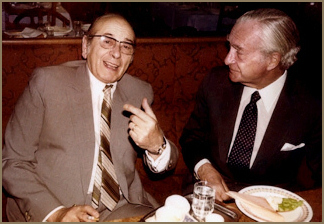 Gábor Petri, rector of the medical university in Szeged, and George Mendelssohn, founder of the Vox record company, in Budapest, late 1970s. 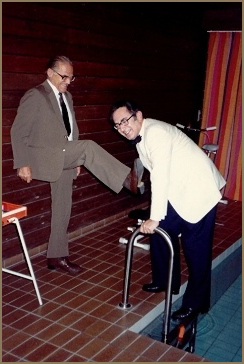 Both men attended the Fasor gymnasium during the 1930s. 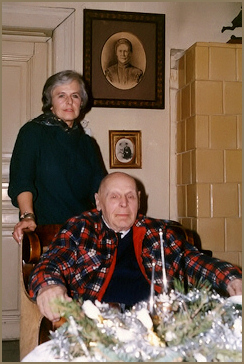 Jenő Rados, member of the scientific adacemy and passionate pianist, with his daughter on his 90th birthday. 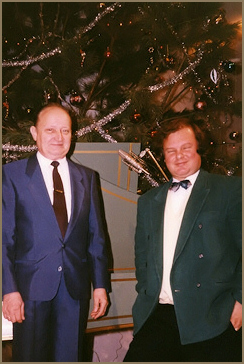 Christmas concert at the House of Arts in Szekszárd with violinist Dénes Kovács and flutist Béla Drahos. 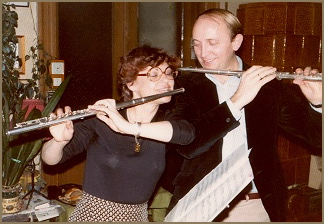 Flute duet with Bea Crivelli and Lóránt Kovács at Sebestyén's home, early 1980s. 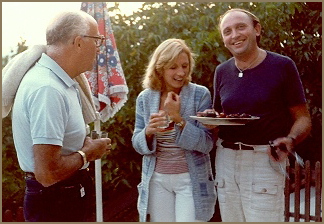 Dinner at the home of Lóránt Kovács, his wife Mária and Italian ambassador Mario Franzi, early 1980s. 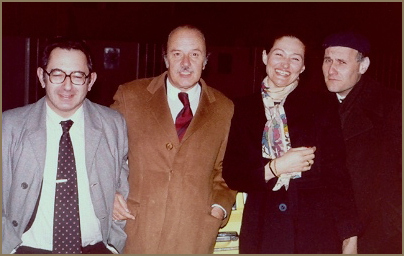 Hungarian actor Róbert Rátonyi in Sebestyén's home, early 1980s (left); János Sebestyén, Venezuelan ambassador Nelson Hernández, Veronica Bánky of the Italian Embassy in Budapest, and piano professor Ferenc Rados, whose past students included both András Schiff and Zoltán Kocsis, 1980 (above). 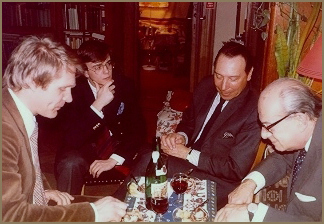 Pediatrician Tibor Verebély, Portuguese ambassador Fernando Vieira and his son, and professor and music expert Péter Véghelyi, at Sebestyén's home, 1980. 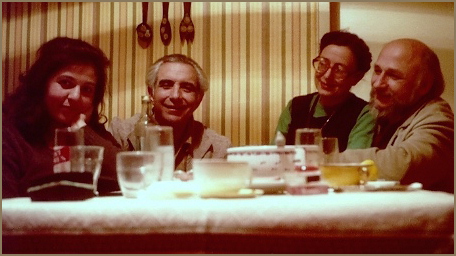 Pianist Maria Ilieva and her father, composer and conductor Konstantin Iliev, actress Mara Chapanova and her husband, composer Georgi Tutev, in Sofia, early 1980s. 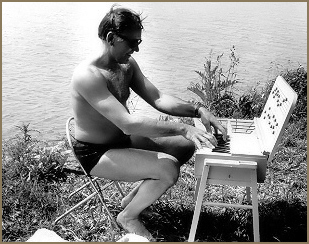 playing his water xylophone, late 1960s. 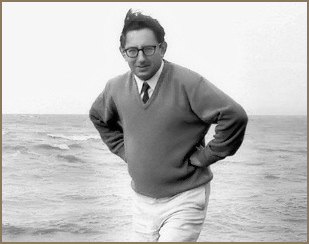 Flutist Zoltán Jeney, early 1960s. 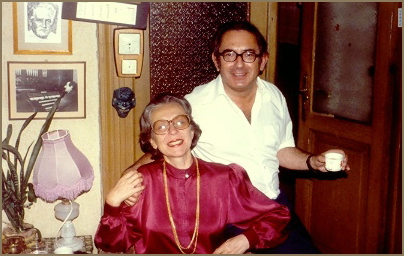 and Manuela Pertile, early 1970s. 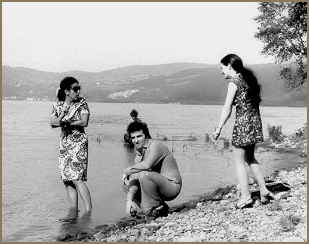 Manuela Pertile, János Sebestyén and Judit Makó.